Manufacturers of offroad vehicles have been meeting increasingly stringent emissions standards for the past several years, and Deere & Company is no exception. Starting in 2006, in particular, Tier 3 regulations from the Environmental Protection Agency require specific reductions of oxides of nitrogen in nonroad diesel engines. Deere has developed a family of new EPA-certified Tier 3 engines for use in its range of offroad equipment. In the case of one combine harvester, fitting surrounding components to a new Tier 3 engine led Deere engineers and two of the company’s suppliers along a path of intensive cost analysis and redesign. The Tier 3 engine was a different size than the previous engine, so modifications to the basic combine platform were needed. 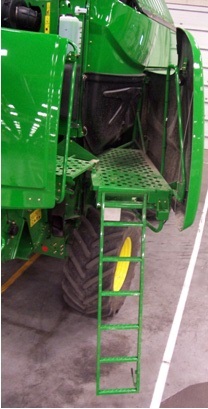 A major assembly slated for redesign was the swingout landing deck, which has an integrated ladder that provides access to the combine during maintenance. The entire device swivels from the side or rear of the combine at a height of about 6 feet from the ground. The service person can then pull out the ladder, climb up several steps to the secure footing of the landing deck, and attend to equipment maintenance. Because of the change in engine size, the new landing deck assembly had to be larger. The engineers also wanted to increase the structural rigidity of the assembly at the least possible extra cost without adding weight. As work on the new design progressed, the Deere team identified some cost challenges. First of all, estimates showed that the redesigned assembly would come in at 8 percent above target cost. Second, and of more concern, the supplier quote for the redesigned assembly was 26 percent higher than target. Deere tackled the cost issues using Design for Manufacture and Assembly (DFMA®) software from Boothroyd Dewhurst, Inc. (Wakefield, R.I.). The software helped them analyze the design for the landing deck and simplify the assembly to save cost. DFMA brainstorming sessions with design and manufacturing engineers, supply management, and suppliers responsible for fabricating and assembling the landing deck yielded 83 design improvement ideas. Shorten the deck sheet. The landing deck sheet is a section of perforated metal flooring that personnel stand on while servicing the combine. A decision to shorten the deck sheet meant Deere could get lengths of steel flooring more economically from a standard-size sheet. “We went to a sheet size that was less expensive to begin with and saved dollars per pound,” says Saxton. “Plus we utilized the sheet much better. Better raw material cost and less scrap represent a two-for-one benefit.” Changing the size of the deck sheet reduced raw material cost by 60 percent. Replace the ladder rails. In the concept design, the siderails for the pullout ladder were made from round steel tubes. After some investigation, the design team discovered that changing the geometry from round to rectangular tubes would gain them structural support at lighter weight, reduce the manufacturing operations required for mating parts, and reduce cost. With input from their supplier, they also pared 3mm from the tube length, which allowed three sections of tube to be cut from a standard 20-foot length.